The new unemployment numbers show a joblessness rate of 8.3 percent. From a political perspective, this is good news for the White House. Even though the Obama Administration projected that the unemployment rate today would be about 2-percentage points lower if the so-called stimulus was adopted, most people aren’t looking at the numbers analytically. Instead, what matters most is the trend. And since there’s been steady movement in the right direction, the President can say it’s somehow because of his policies. Whether that’s true or not doesn’t matter. Politics is about perception. 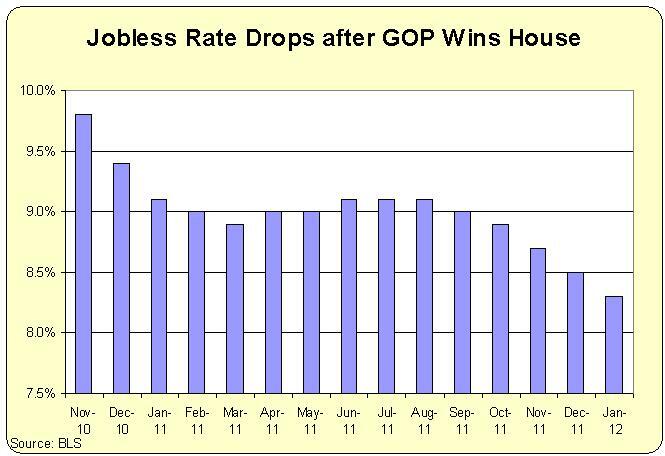 And since I began predicting, back in 2010, that Obama would win reelection if the joblessness rate was 8 percent or below, the folks at the White House should be smiling. But there’s another group of people who should be happy. Republicans can argue that the improvement began almost precisely at the moment they took control of the House of Representatives. Here are the monthly numbers, beginning in November 2010. But I’m not here to spin a happy story for either Obama or House Republicans. The real story is that gridlock works, just as our Founding Fathers envisioned. Once Republicans took control of the House, it meant that there was almost no chance that Obama would be able to impose more of his agenda. This means no possibility of cap-and-trade industrial policy. It means no big new spending initiatives. It means no threat of a value-added tax. And this means that the private sector finally has some degree of comfort that things won’t get worse in the future. This is not a trivial matter. Indeed, the Great Depression lasted so long and was so deep in part because Hoover and Roosevelt kept expanding the burden of taxes, spending, regulation, and intervention. The productive sector of the economy kept getting knocked to the canvas, so there’s was never an opportunity to adjust to the new burdens. This isn’t to say gridlock, by itself, solves problems. Necessary reforms such as the Ryan budget can’t be implemented if we have gridlock forever, and that means America eventually would become another Greece. But if the choice is between moving in the wrong direction and treading water, then the latter is better. It means the economy can adjust and slowly recover. Yes, the potential long-run growth rate won’t be as high because of the bad policies implemented in Obama’s first two years, but gridlock means that nothing really bad will happen in the near future. As such, we can at least expect continued improvement in the jobs market and decent – albeit not impressive – growth. Ironically, that’s good news for Obama. If he wins reelection, he should send a bouquet of roses to John Boehner. That is the growth trendline of DECLINE. The bar for decent growth is set by the entire world at 4-5%. That is what would be considered on-par growth. Growth, of say 2.5%, in a world that grows at 4-5% — perpetually compounding year after year means one very definite thing : Decline. In the longer term, almost nothing else matters. If your prosperity is on a diverging declining trendline compared to the world average, you will eventually cry uncle, as your once priviledged standard of living relentlessly looses ground against the world norm — hippie and other non-pecuniary standard of living enhancers will be unable to compensate for a never ending loss of prosperity in perpetuity. You will eventually cry uncle (…after you have called Uncle Sam first and gotten sc…d several times along the vicious cycle of decline). The endgame of prosperity is played on the perpetual compounding of growth rate. That is the one simple and central concept of economics that even superficial perception-blinded non-mathematical geniuses should be able to comprehend. Yet, little is heard about how decisive of a factor growth rate is to mid-long term prosperity. We are technically in recovery, but the recovery is slow and mediocre, and I have been surprised to see that these first 2-3 year data points already seem point towards a permanent lower growth trendline. Surprise, because the more substantial de-motivators of HopNChange have not yet kicked in yet, namely and primarily ObamaCare, the one piece of legislation set to irreversibly steer America in the direction of a slow growth, irreversibly declining, Euro-style welfare state. Yes there will be 2,3 even 4% growth quarters ahead in the fractal behavior that modulates the trendline. But the endgame of prosperity is the longer term growth trendline. Entities representing a rising American collectivism will cheer the success once these aberrant higher growth quarters inevitably come. After all, even France has an occasional survival-level growth quarter (say 3-4% annualized quarterly growth). But, again, what matters is the trendline. The US had been on a 3-3.5% growth trendline. Now, after Bush and more importantly four Obama years, the stage is now set for an American 2.5% annual growth trendline. Yes, Bush led Americans into mistakes, but whether by intention or accident, most of Bush’s mistakes were reversible. After all, the unfortunate Iraqis and Afghanis don’t vote in America, so it is easier to reverse these policies once the American public finally realizes that they were mistakes. But try to roll back ObamaCare once half the population has become reliant on the subsidies of inefficient benefits paid by others – and consequently is living a slightly more indolent life – and has made permanent lifetime decisions based on that assumption! Watch Europe and you see how easy it will be. Medicare and Social Security are on a trendline to bankrupt the nation? Well introduce the third mother of entitlements: ObamaCare. The apprehension associated with lower economic performance and decline, will inevitably trigger further voter requests for more “Care” packages, until most finally realize that America is deep into the Laffer curve (though few would admit that openly). I.e. : Francification. To follow up on Mitchell’s Rule, gridlock is a sufficient condition to avoid decline when the trajectory or government spending is flatter than the GDP growth trajectory. Since this is not the case — as it would be hard to have GDP grow at 6% rates with Obama in office, or any other immediately electable candidate for that matter — gridlock only cements the destiny of decline. Albeit a slower decline than under a cadre of HopNChangers occupying all branches of government. But slower decline is hardly a consolation for a European immigrant watching the Euro-movie being played to an excited American audience. I wish every American could move to Europe for five years, not to marvel at the superficial ease with a tourist may visit Paris using collective transportation, but also try to find a job, see what his purchasing power is with the money earned, try to find a dwelling comparable to what he had in America, and yes, finally trying to haul two kids in rain a sleet to board the flu virus infested collective transportation he so admired as a turist, so he can finally buy the food for two days and three rolls of toilet paper since this is all he can carry in his biodegradable grocery bag while he chases his two kids in and out of the public transportation system. Teach your children the flexibility of international migration. They will most likely need it, and that will be a phenomenon Americans have never seen before. On december 6th 2010 -thanks to an accord in the Senate- it was clear that the 2003 Bush Tax Cuts would be extended. Since that moment unemployment went down. When the Bush Tax Cuts were enacted in may 2003 the unemployement rate began a slow steady descent (would like to see what Tax Cut demonizer Paul Krugman says about this). I forecast that the extension of Bush Tax Cuts in on december 6th -date when we knew they would be extended- was analogous to implementing the Bush Tax Cuts in may 2003: Tax increases were expected in january 2011. When they never happened that was similar to the Bush Tax Cuts: An expected tax increase never happened and that is has similar in may ways to a tax cut. That has the same affect that the Bush tax cuts had but with much lower intensity. I totally agree with what Mr. Mitchell says here. But this is too a HUGE victory for Supply Side economics over keynesianism and tax cut demonizer Paul Krugman. We are too living a post real estate bubble period. That may be bad for growth. Unfortunately, in an era where a president can rule by bureaucratic fiat and executive order (keystone pipeline, EPA carbon regulations, border state gun dealer regulations, and more) the Imperial Presidency rolls on. His Imperial Highness, Dear Leader Obumma, and his staff of storm-troopers-in-training “can’t wait for Congress to act” and feel no compulsion to submit to the separation of powers (Fast and Furious, Eric Holder “testimony”, bombing Libya, etc.). I hate to think what he will do after winning another four years and appointing 2, 3, or 4 more of the Supremes (another ruling oligarchy).